We’re pretty sure you already know what this podcast is about: two teams left, two epic performances, one in the comeback from 25 points down in 24 minutes and the other being another stifling defensive performance. 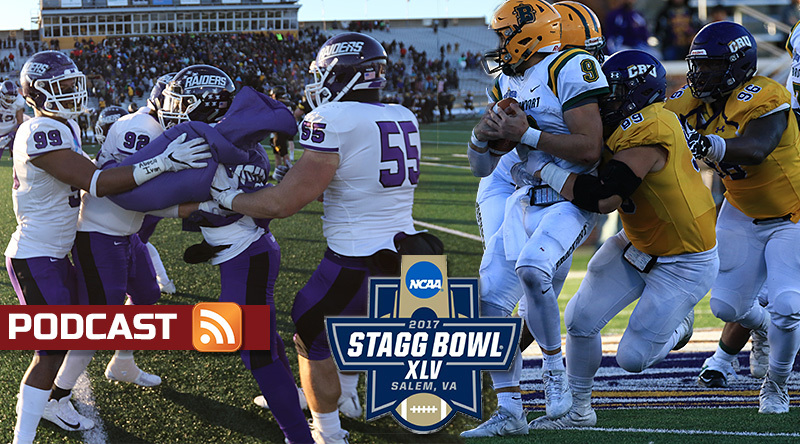 Pat and Keith break down the games, with Keith looking at each game a second time and giving his first keys to the game for Stagg Bowl XLV. This week, Fanraise is the sponsor of the D3football.com Around the Nation Podcast. Find out more at Thefanraise.com. Pat and Keith hand out game balls, look at both semifinals and preview their final Top 25 ballots in this week’s D3football.com Around the Nation Podcast. This entry was posted in Around the Nation and tagged Brockport, Mary Hardin-Baylor, Mount Union, UW-Oshkosh. Bookmark the permalink. I am a mount fan but I was really impressed with Kasper. that guy threw some tough passes.